During the weeks up to and including Remembrance Day on 11 November, people wear a small red poppy in an act of remembrance and to support the work of the British Legion. A few years ago we received the message below from one of the visitors to our website. Let’s not make this happen this year. I’m 45 and know that I wouldn’t be here if it wasn’t for the brave old soldiers from round the world that made us free.I felt very sad today as I was in Hammersmith London, and not many people were wearing Poppies and not many people stopped and stood still for the one minute silence. I work for London transport and going back 5 years every bus would pull over and stop, well not today people were still rushing about there business and didn’t bother to respect the dead. Even on the news you see the soldiers at the cenotaph standing still look in the back ground people walking about, still driving. As our country has become more cosmopolitan the old traditions we had in England are dying out, as the new generation don’t give a dam. Tomorrow I visit all my family graves to place poppy crosses and then lay a cross for the fallen soldiers of Hammersmith/Fulham. 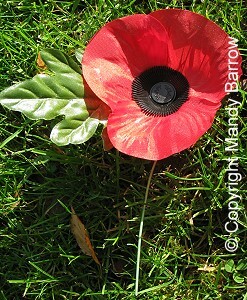 In England, Wales, and Northern Ireland, the poppies have two red petals, a green paper leaf and are mounted on a green plastic stem. In Scotland, the poppies are curled and have four petals with no leaf. We shall always remember them with pride, where ever they lay, for their courage,valour and self sacrifice! May god bless them and grant them eternal rest. I found the site very interesting, although being 47 yrs old. I still think it is very important to teach the children of today just what there relatives went through,to give us a safe future. The poems on the site are really heartfelt considering i can remember as a child hearing my father crying at night because of nightmares he was having,because of the war, and seeing his brother killed by a mortar. One thing that I don’t understand though is today, I have heard our soldiers called boys and girls,yet over sixty years ago they were called men and woman, I think some people seem to forget that sixty yrs ago they were only children as well, but they still gave their lives for their country, that is why we must never forget them, and what they did for us. I enjoyed reading and learning about your Remembrance Day pages. Its something that today’s younger generation don’t understand or appreciate as much as those who witnessed WW1 & WW2. Reading your website brings it it to the forefront of your mind and makes you thankful for what we have.